SD Studios art classes focus on fostering growth for critical thinking, engaging imaginations and problem solving through exploration. Students gain confidence and knowledge with supportive and encouraging instruction while learning new techniques and developing an array of artistic skills. Through creative, fun and out of the box teaching methods, students excel artistically while engaging in imaginative and thought provoking projects. Art projects are created independently, in pairs or in groups with guidance, suggestions and feedback. The process and exploration of art making is more important than the product and students are encouraged to follow their interests, their instincts and unlock hidden potential. SD Studios serve: Oak Park, Berwyn, Forest Park, River Forest, Elmwood Park, Cicero, River Grove, Melrose Park, Bellwood, Lyons, La Grange, Franklin Park, Brookfield, Westchester, Norridge, Western Suburbs and Chicago residents. 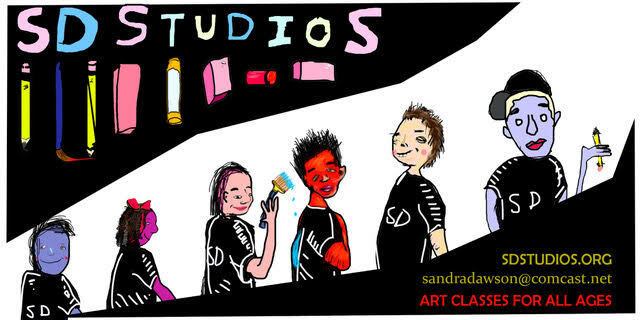 SD Studios Offers: adult art classes, kid art classes, art coaching, professional development, and workshops to all ages and levels of students. Classes are offered at the studio and at your location. We service preschools and daycares, elementary schools, health centers, special needs centers and senior residencies.